Ref. 2597 ?First Generation? 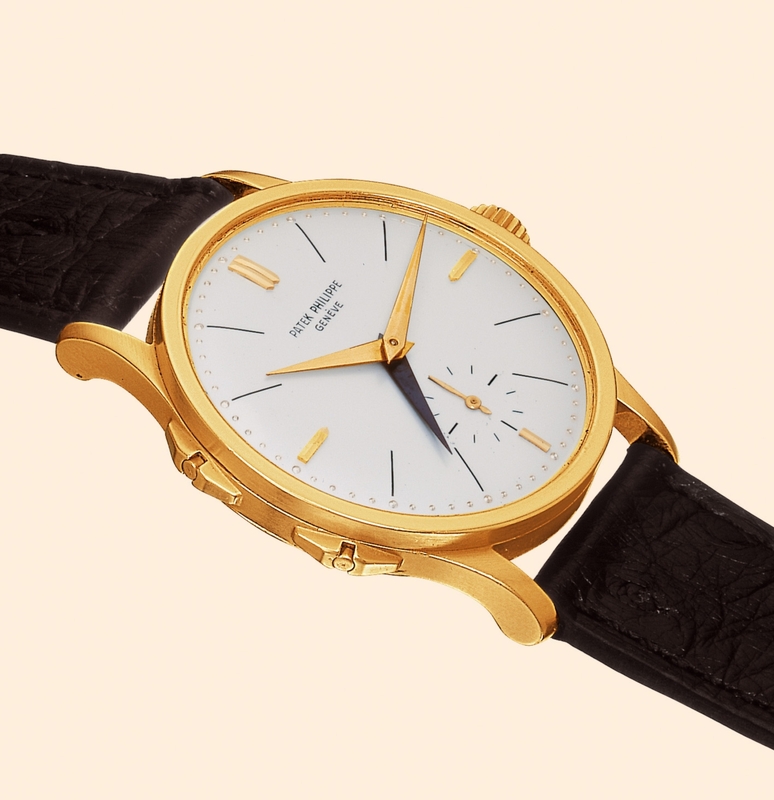 Patek Philippe & Cie, Genève, "Calatrava", No. 727309, case No. 309776, Ref. 2597 HS (Heures Sautantes). Made in 1959 and sold on Oct. 22, 1959. Very fine and rare, two time-zone, 18K yellow gold gentleman's wristwatch with three hands and an 18K yellow gold Patek Philippe buckle. Accompanied by the Extract from the Archives. C. Three-body, solid, polished and brushed, flat bezel, concave lugs, band bearing two buttons activating the second blued steel hour hand forwards and backwards to indicate world time, independently by steps of one hour at a time. D. Matte silver with applied yellow gold and painted indexes, subsidiary seconds dial. Yellow gold "Dauphine" hands. The present watch was updated by the addition of the extra hand at the time the second adjustable jumping hour hand was launched. Ref. 2597 HS. Production of this reference started in 1958. It was produced in two series: - first series, with an adjustable jumping hour hand; - second series, with a second adjustable jumping blued steel hour hand; the manufacture of this second device began in March 1962.